KAUKAUNA — A driver and passneger escaped injury Wednesday, March 1, 2017, when the vehicle they were in nearly went over the edge of Veteran’s Memorial Bridge. 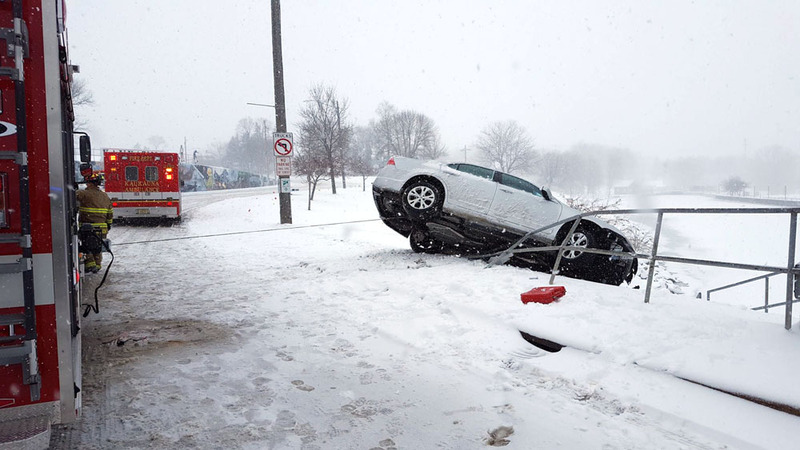 The Kaukauna Fire Department was called about 1:15 p.m. for a report of a vehicle accident with a car hanging off the bridge in snowy weather. An engine, support unit, and ambulance all responded to the scene, according to a fire department news release. 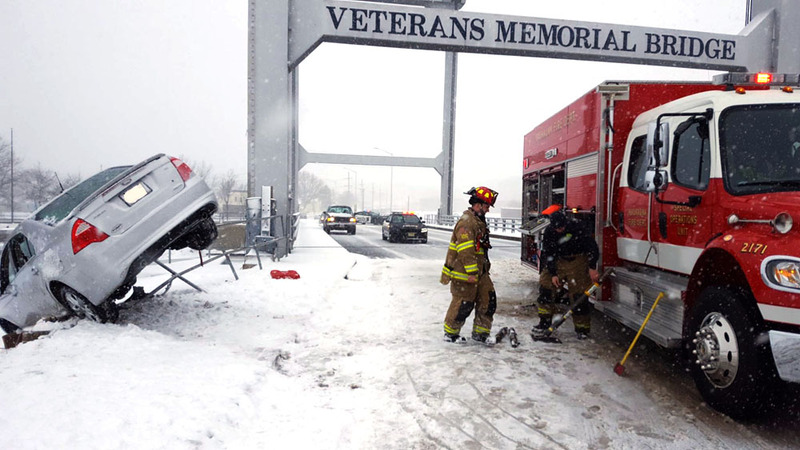 Upon arrival, firefighters discovered a white sedan had slid through the snow, jumped the curb on the north end of the bridge and had been prevented from rolling down the hill into the river by a guard rail. One passenger had gotten out of the car by the time first responders arrived, but the driver was unable to escape due to the position of the vehicle. Firefighters used a 9,000 pound side winch on the support unit to quickly stabilize the vehicle and added cribbing for additional support. Rescue crews then were able to extricate the driver from the vehicle, according to the news release. After all occupants were safe, firefighters had to cut through the guard rails to get the car safely back onto the roadway. A car narrowly escaped rolling into the Fox River March 1, 2017. Kaukauna Fire Department photo.